We recently received a gracious offer from a trusted comrade to conduct a survey of people’s feelings and experiences about our action camps, following on the heels of group discussions about how to continue improving our practices. In an effort to continue learning and developing better practices, we would like to invite all participants to complete this survey. Your feedback will help us continue to improve as a climate justice organization, and to provide trainings that are more beneficial to the movement. 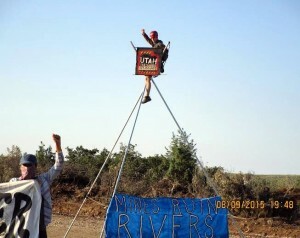 Land defenders assembled two tripods as a part of a overall work blockade at the site of the tar sands mine in the Book Cliffs of Utah. The attached PDF file is the Peaceful Uprising Action Camp Feedback Questionnaire, a lengthy, information-dense survey created with a unique format that includes an Outline, Security Culture, Healing and Emotional Support, About, and Feedback Form. This format may be confusing with a few imperfections. Please ASK questions to minerals [at] riseup [dot] net and seek out another action camp participant to find clarity with. Please read through the full version before answering the feedback form. Within the full version, please skip around based on your own personal needs. From the many experiences shared, we will create a summary presentation of the responses, outlining patterns and major and minor accomplishments/areas of improvement, create transparency of experiences, and help Peaceful Uprising create future focal points for their on-going efforts. The presentation will be open source and available to all interested in an effort to foster wider community growth. This is an accountability and transparency process giving you the opportunity to express your honest personal experiences. This process seeks diversity of responses. Please include experiences of feeling safe/endangered, uplifted/hindered, compassionate/angry, valued/disdained, wise/naive, and much more. Please understand that prioritized intentional space is needed to read, comprehend, reflect, and then reply to the feedback form. It is vital that you forward this survey on to anyone you know that has participated in an Action Camp with Peaceful Uprising. We are all wounded, we are all healing! To Shadow, the neglected or repressed parts of our being, which are both essential, consistent places of struggle, and our magnificent potential. Acknowledging and honouring Shadow as a guide for how to heal, move towards vulnerability, and compassion with insight as our ally. Giving visibility to Shadow we become mirrors for ourselves and for each other, energizing prayers for releasing those patterns and creating new neural pathways of our beings and our togetherness. I want to thank EVERYONE who helped and is helping in this process. We are awesome! 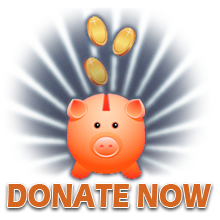 This accelerating journey is in need of more helpers! Reply to minerals [at] riseup [dot] net for EVERYTHING regarding the Action Camp Feedback Questionnaire.